Here’s the ingredient list – ready? Buy raw, unsalted almonds in bulk. 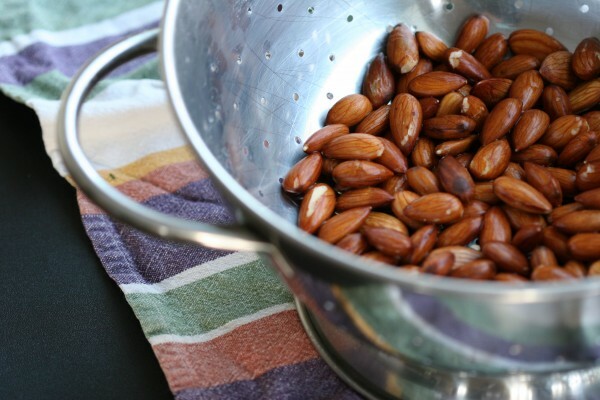 Place 1 cup almonds in a bowl and cover with water. Let sit on the counter overnight. Drain and rinse. Cover almonds with water, and allow to sit overnight. Drain and rinse. Prepare glass jar or container by stretching cheesecloth over the top and securing with a rubber band. Blend on high for about a minute. Slowly pour mixture over cheesecloth. Let drain for at least an hour. Refrigerate strained milk for up to 3 days. 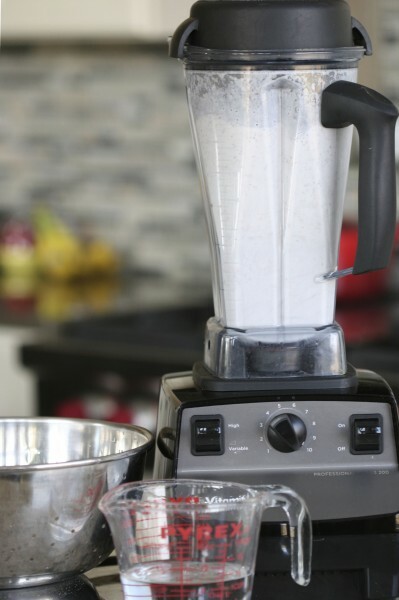 Note: The remaining solids can be used in smoothies or pancake batter, or dried for several hours in the oven and used as flour in cookies or other recipes. Cover a large jar or pitcher with a piece of cheesecloth and secure with a rubber band. Pour almond milk over cheesecloth, and let sit for about 2 hours while liquid strains. Refrigerate for up to 3 days. Ready to try making your own? Let me know how it goes! I’m going to try this because I am an almond milk drinker (lactose intolerant). It looks easy and since Morgan has convinced me to buy a Vitamix, I have the tools. Thank you, Costco, for reasonably priced almonds (and blenders). 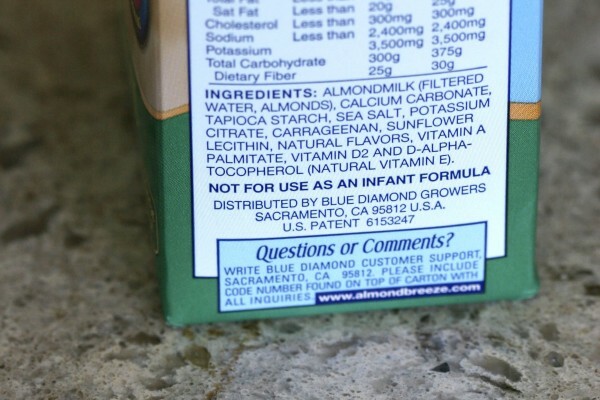 Note: If you read the ingredient list on most “enriched” almond milks, you will see a list similar to the one on the carton shown above. If you read it you will note that many of the additional ingredients are calcium and vitamins. The downside to almond milk is that it lacks some of the important nutrients that animal milks have, namely, calcium and certain vitamins. So, ladies in particular, take a good multi-vitamin that has calcium with your homemade almond milk to make sure your bones stay strong and healthy. Lorri, thanks for the reminder about making up for the GOOD things that are left out! The store-bought version is tasty but yes, rather expensive. I’ll give this recipe a shot. Thanks Morgan! Let me know how you like it Sue! Sue! Thanks for experimenting and providing feedback! I go between dates or figs or a touch of honey… but I’ll ry Stevia too! I’ve been drinking almond milk for years – and never thought about looking into making it at home. The second we get back from Tahiti (yeah, I just had to throw that in there! ), I’m going to try it! Thanks, Morgan! Thank you Morgan. Exactly what I needed! Great looking site too! Thanks for stopping by Julene — and let me know if you make it! I make it every few days and love it. Experiment with flavors too… I like adding a handful of figs or dates. Hope you’re well! Once you start making almond milk, it’s impossible to go back to the boxed version. 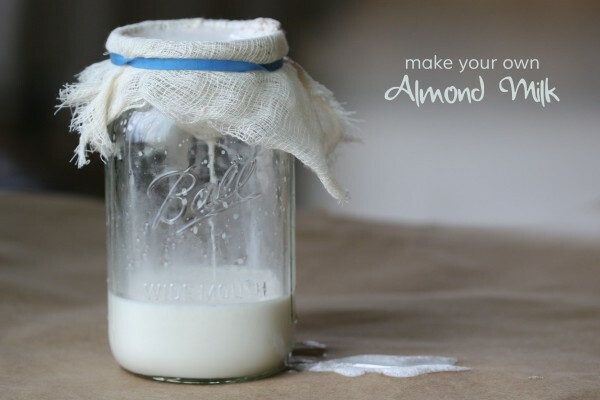 Have you tried using a nut milk bag? It’s so much easier than cheesecloth, and it’s reusable! I also like to make coconut milk. I cup of organic, unsweetened desiccated coconut + 4 cups water soaked together for an hour or so and then blend. Much cheaper than almonds! Hey Erin! I JUST got a nut-milk bag and love it. Using it at this moment,in fact! I’ll definitely try the coconut milk too. Thanks for stopping by! Just wanted to drop you a note Morgan to let you know that I have been blending the almonds and using the almond milk on my cereal with nothing else added. It’s been great! Love knowing that there are no additives. Hi Julene! I just made a new batch this morning… then made some peanut butter — with JUST peanuts! Great to hear from you. For starters, I appreciate your recipe, so thanks! Having said that, I have tried it and many others, however, the Blue Diamond Almond Milk, which is the carton you show, is superior in my opinion if you like the taste and texture of real milk. Also, making almond milk is not economical in my book with the price of raw almonds being what they are these days. The math is such that a half gallon of Blue Diamond for $2.99 costs less than you will pay to make a half gallon of homemade almond milk with much less time and effort. As for the ingredients, I don’t see anything on there that is really too scary. I suppose the carrageenan can cause some people digestion issues, but it hasn’t for me and I don’t view the substance as dangerous. Again, thanks for the recipe. I am not trying to be contrary here. It is just that I have made lots of almond milk and I truly believe that, in this case, the store bought version tastes much, much better if you want a milk substitute. Thanks. Hey Derek! I appreciate your comment. I hear you on the economics – so I try to buy almonds in bulk – and any time there’s a deal to be had. I really like being able to tweak the flavor to my own personal tastes… And I like not paying for “packaging” when I don’t have to. Like you, I love the taste of the Blue Diamond, but most often, opt for homemade. Thanks for stopping by! Used a similar recipe which came with our new Blendex. Great taste, we’ve been using the Silk product and this is comparable. Have been looking for a Nutmilk Bag but unable to find one in small town Ontario.